The area of top scientific interest for Mars Science Laboratory is at the base of the mound, just at the edge of the landing ellipse and beyond a dark dune field. Here, orbiting instruments have detected signatures of both clay minerals and sulfate salts. Scientists studying Mars have several important hypotheses about how these minerals reflect changes in the Martian environment, particularly changes in the amount of water on the surface of Mars. The Mars Science Laboratory rover, Curiosity, will use its full instrument suite to study these minerals and how they formed to give us insights into those ancient Martian environments. These rocks are also a prime target in checking for organic molecules, since these environments may have been habitable -- able to support microbial life. Canyons were cut in the mound through the layers containing the clay minerals and sulfate salts after deposition of the layers. These canyons, much like the Grand Canyon in Arizona, expose layers of rock representing tens or hundreds of millions of years of environmental change. Over its two-year primary mission, the rover may be able to investigate these layers in a canyon close to the landing ellipse (shown by an example rover path), gaining access to a long history of environmental change on the planet. 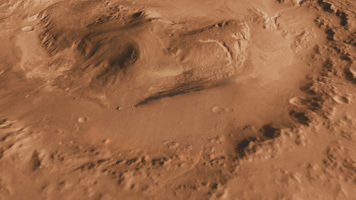 Above this region, the material on the mound has spectroscopic characteristics similar to dusty areas of Mars, indicating it may be composed of dust that has been cemented into rock. NASA's Jet Propulsion Laboratory, a division of the California Institute of Technology in Pasadena, manages the Mars Science Laboratory Project for NASA's Science Mission Directorate in Washington. Arizona State University, Tempe, operates the Thermal Emission Imaging System. The Mars Orbiter Laser Altimeter was operated by NASA Goddard Space Flight Center, Greenbelt, Md. The University of Arizona, Tucson, operates the High Resolution Science Imaging Experiment. JPL manages Mars Odyssey and Mars Reconnaissance Orbiter for NASA's Science Mission Directorate.